Kicked off in Seoul on 24th February, Sunmi is having her world tour from New York to Hong Kong. And she will be coming to Taipei very soon with her Waning trilogy “Gashina”, “Heroine”, and “Siren”, really can't wait for it! 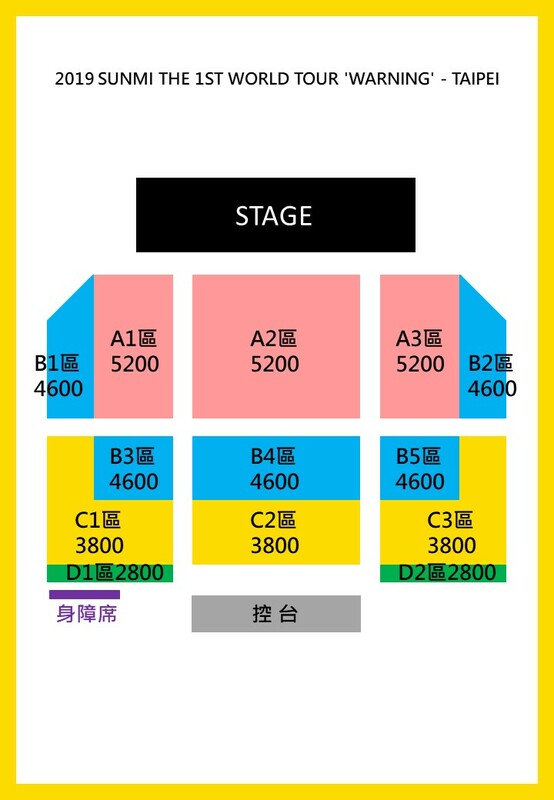 So be ready with your ticket to join us in 2019 SUNMI THE 1ST WORLD TOUR WARNING! Up to 4 tickets are allowed per order, up to 8 tickets are allowed per person. Up to 4 tickets are allowed per order, up to 8 tickets are allowed per person. In order to accelerate your order process, you may choose "Computer generated" for seat selection. VISA, MASTER, JCB cards are acceptable for credit card payment. American Express, Diners and UnionPay credit cards are not acceptable. ♦You only can choose "ibon取票(Pick up Via ibon)" as your collection method. Please get your tickets printed at your nearest 7-11 ibon Kiosk in Taiwan. Go to your nearest 7-11 CVS and get your tickets printed with the following steps. Find an ibon kiosk at the 7-11 CVS. Please click "票券中心" → "售票系統" → "取票" → "拓元售票系統" at ibon. Please bring the voucher to the cashier in the same 7-11 CVS and get your tickets printed. Please note an amount of NT$30 in cash per order as service fee will be charged upon ticket pickup at 7-11 CVS. If the purchase date is Apr. 3, 2019, then the deadline for the refund application is Apr. 8, 2019.